My favorite item from the J.Crew sale this past weekend is definitely this Honeycomb Cable Sweater in Heather Spearmint. Right away, I was daydreaming about pairing the crisp, minty-blue with my other new favorite find, this H&M navy polka-dot button down (post coming soon). I really wanted to wear a different color pant with this (too much navy on navy I think) but nothing else looked right…note to self: find grey jeggings. I won’t go into too much fit detail about this sweater since Jean already did such a great job, but I will say the sleeves fit really slim (had to tug a bit to get them on) and the torso fits a little loose, typical of J.crew sweaters. I don’t mind the relaxed fit since I’ll be layering under these. Instead of putting on the button down, and then pulling on the sweater, put the shirt inside the sweater, all nice and straight, and then pull both on over your head. I kept one button buttoned while I pulled both other my head (to keep the shirt in place), and then unbuttoned it before pulling on the sleeves. Then just reach under the sweater and button up. The sleeves and collar were perfectly in place without any twisting, tugging or adjusting. Genius! 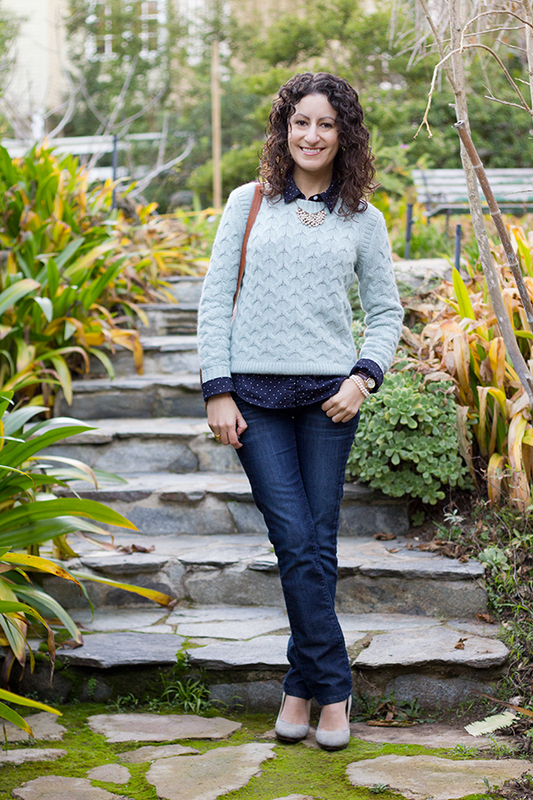 Readers: Any other genius ways to layer a button down under a sweater? I’ve been waiting to see this pretty combo together! I love the tiny dots with the chunkier honeycomb knit. If you can’t find gray bottoms, would you ever wear winter white jeggings? I think it’d add a pretty fresh angle to this outfit, but I know white jeans in cold weather are not for everyone. Thanks again for the timely sale alert on these! You read my mind yet again! Yes, white is another option that I thought would look great (probably because of Khatu’s wonderful white pants that are now forever stuck in my mind). I just hate how hard a good, non-see-through pair are to find! I saw the Rockstars come in white…do you think they’d be really thin & see-through? I second the white jeans with this outfit, but I’m liking the navy+navy plus pop of mint. Maybe also a lighter denim wash would work? I tried on the white ON Rockstar jeggings and they were semi see-through on me (visible pockets). It may be because I have thicker thighs and they’re more snug on me. I second what Jean said. I have been waiting to see this post. Such a pretty combo and refreshing too. This is definitely my favorite outfit. This outfit is minty and fresh. I got the same sweater as a Christmas gift, but I’ve found that it sheds like crazy! White fuzz all over the inside of my coat, the outside of the cami I wore underneath, my purse, the boyfriends coat. Nightmare! Did I get a faulty sweater or does yours shed on everything too? Wow! Your sweater shed everywhere! My navy button-down is fuzzy, and will need to be de-fuzzed, but that was the extent of the damage. Have you tried washing it yet? Maybe a quick tumble in the dryer will help (I haven’t washed mine yet, so I’m not certain it will help)? Although be care of shrinkage if it fits you the way you like. I really like how you wear your watch and pearl bracelet together. Looks great! thanks for the tip! I thought the trouble was me. I love the button down. Can’t wait for the post on it. 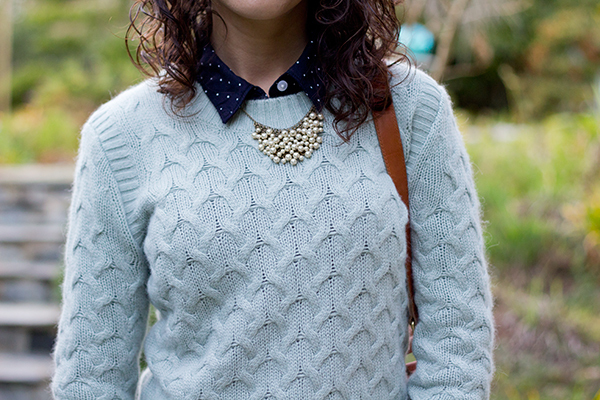 The sweater really goes well with the polka dots shirt! Jane from extrapetite also wore a similar sweater that I love. I didn’t scored any sweater at Jcrew recently. But I do found a jacket from Ann Taylor that fits me very well. Thanks for the tips about hunting blazers and jackets again! love this outfit! i was just checking out that sweater but it just didnt fit me right! oh well, im allergic to angora anyways, so its probably a good thing! i actually always put on sweaters like that. its because im too lazy to take them apart after the first wear. Love the navy polka dots with the mint!! I don’t think it’s too much navy on navy, but maybe you could try black pants or the Loft wool pants. Also, I saw your instagram and noticed that you have 4 of these sweaters? Lol, that good? I got the pine bough today, and now I’m thinking of getting the warm ivory and bright dahlia too. This is the first cable sweater that fits me well and I figure cable sweaters are winter staples, right? Great idea from your Twitter comments! I love the color of that sweater! It will be good for spring time too. Thanks for the great tip! I feel like I misunderstood the question? both at the same time and it’s even faster :P In, in and over; fluff. On perhaps a more relevant note, I would also love this outfit with gray or white jeans! The mint with navy and polka dots is so delicious. I wear sleeveless buttondowns under sweaters. They do double duty as tops in summer, but that way I eliminate both overheating (living in the US South) and twisty sleeves. Love your color combo. Hi LaCosta! The sleeves are easy…just gently bunch the sweater sleeve up a little ways so the cuff of your shirt shows. To get the length of the sweater to show your shirt hem, you can try cropped styles, or I sometimes just fold the sweater under so it appears a little shorter than it really is. Hope that helps!